Marriage is the most beautiful phase in everyone's life. Your life changes suddenly as a special one shares your personal space with you. Life becomes more enjoyable with lots of new relations and responsibilities as well. This phase becomes more enjoyable when you get a perfect match for you. Definitely there are numerous ways of searching for your perfect match, but apart from the conventional method of finding a partner, you can search for your preferences online by registering yourself on any of the matrimonial sites. The use of Matrimonial Sites is a fast-rising trend in the Indian society. You simply need to register yourself on any of the Matrimonial Sites, giving your personal and professional details along with the type of partner you are in search of. 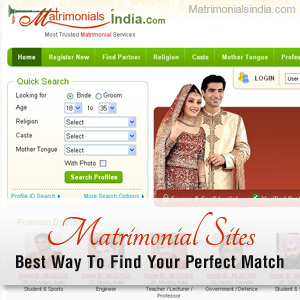 Matrimonial Sites present to you a list of choices that might be your perfect one. One of the major advantages of Matrimonial Sites is the free online registration that allows you to access the database of a number of boys and girls. As soon as you register to the website, create your profile giving details about your work, preferences regarding your partner and upload some of your latest pictures into your account. By registering yourself on a Matrimonial Site, you easily get an access to view the profiles of others. There are different Matrimonial Sites like Shadi.com, Jeevansathi.com, Bharatmatrimony and many other where you can easily register and find a suitable partner. Once you choose some profiles as per your desire you can easily establish links by online chat. It's easy and time saving as well. However, one thing you need to consider is, don't jump directly on personal information. Let the thing go the way they are going. Moreover, online chat might sometime give you wrong information, so you need to thoroughly verify the details before making the big decision. In this fast moving world, Matrimonial Sites is the best place to find someone you can share your personal space with. Good luck for finding your perfect match.